An accessory keyboard is now available for the PlayBook. Research in Motion Inc. confirmedtoday that it’s introducing aBluetooth-enabled mini keyboard for its BlackBerry tablet, news thatwas unwittingly leaked via information posted on the Web site of TheSource, which is exclusively accepting preorders in the Canadian retailmarket place. Related Story | PlayBook OS 2.0 too late? Besides a full QWERTY keyboard, the new accessory has an integratedtouchpad that supports BlackBerry PlayBook Gestures, sousers can makea single tap to simulate a mouse click or a two-finger tap toright-click, for example. RIM’s new mini keyboard for thePlayBook tablet. The keyboard is less than 6 mm thick and comes with a case thatconverts into a stand for the PlayBook, virtually turning the tabletinto an ultra lightweight laptop. It’s now available forpre-orders at aprice of US$119.99. 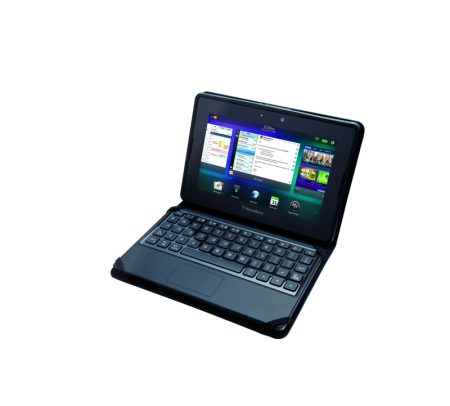 The keyboard features 128-bit encryption to keepdata flowing between it and the PlayBook secure. RIM says the accessory, which uses the micro-USB adapter that alreadycomes with the PlayBook, has a battery life of 30 days when fullycharged.